Apparently these things are mystifyingly beautiful. You be the judge. I have to say that while the profile of the Fiends is good, there are better profiles in the Elites section but it isn't the profile that you take these for anyway. Even so, the profile is thus: Weapon Skill, Strength and Toughness of 4, 3 Wounds and Attacks, Initiative 6 and Leadership 7. The value that stands out here is the Initiative because it's so damn high! Initiative 6 means that there are very few units that will attack before them and that even includes a fair amount of characters. According to the Reference section in the rule book (I haven't had a chance to go over the new Codexes/Codices yet) the only armies that will reliably be able to go toe to toe on values alone are the Eldar and Dark Eldar (will have to check the Eldar codex when I get the chance to confirm this). This alone gives them an edge but their main edge is in their rules but we'll get to that. Now points wise they cost 105 points. which you may be thinking is an expensive option but that buys you a 3 Fiend unit and each additional Fiend costs 35 points and you can have an additional 6 for a total unit size of 9. 9 wounds, and 9 attacks for 105 points isn't too shabby and at the maximum unit size you're talking 315 points. For that you get 27 attacks and 27 wounds which is pretty impressive. Now they are still pretty pricey but unlike the Beasts of Nurgle or the Bloodcrushers who total at almost 100 points more, the Fiends cost CAN be absorbed by a smaller army. Now obviously if you're fielding a 9 Fiend unit in a 1000 point game something else will suffer for it but it is doable if you really like Fiends (and can afford £139.50 on a single unit). 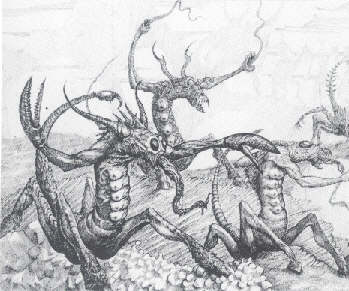 I wouldn't like seeing these coming at me, no matter what the Codex says. 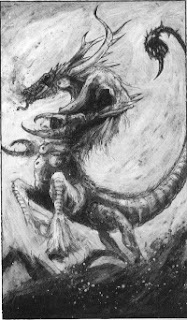 As with the Beasts of Nurgle, the real strength of the unit lies in the combination of rules that it has. First and foremost it has the Daemon of Slaanesh rule (Fleet, Rending and can Run an extra 3"). It is also a Beast so has the Fleet (again), Moves Through Cover and Very Bulky special rules as well as being able to move 12" in the Movement phase, not being slowed by Difficult Terrain and being able to Fall Back 3D6". This is all very good but it isn't why Fiends are so good. They have two special rules from the Codex that really give them a massive edge when it comes to combat and the first is their Soporific Musk. The Musk takes effect when the Fiends make a successful charge against an enemy unit and reduces the Initiative value of the charged unit. There are two things that make this so phenomenal and the first is that the Initiative reduction is 5 points. In and of itself that's pretty impressive but then at the moment this CAN lower the value below 1 and therefore the enemy unit is completely prevented from attacking (which is very Slaanesh). This is, of course, until Daemon players get an FAQ that's actually of any use where this nifty little trick might be gotten rid of. Think about it, a unit of 4 or 5 of these will have 12 or 15 attacks that they can make without any fear of repercussion against most units if they charge. How cool is that?! There's also the fact that other units can take advantage of this Initiative cut too... Think about it. The second Codex rule is the Disruption Song and this has the ability to reduce the Leadership value of any enemy Psyker within 12" of the Fiends by 1 point. This might not seem a lot but I believe that it stacks so if a Psyker is in range of 2 units then he takes -2 to his leadership for Psychic Tests and even a single point reduction can mean the difference between dead Daemons and dead Ultramarines (not that I hate the Ultramarines or anything... Wink wink). Again I must apologise for the lack of picture, there wasn't another one that I liked/wasn't pornographic. Now then as you can see these guys/girls/things can't be upgraded but they really don't need it. They're designed specifically for taking down tougher units. They might still struggle against Terminators but rending gives them a pretty decent chance of at least killing one of them. 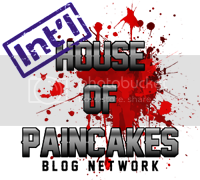 They make the charge which completely stops them from attacking and hammer home as many attacks as possible to wipe them out. I'd recommend running an average unit of 5 minimum so that you get 15 attacks and wounds. Now an important thing to remember is that the Initiative penalty applies not only to the Fiends attacks but also to any other unit attacking in that turn so like the Beasts of Nurgle they have a supportive capacity but theirs is more offensive than defensive (the Beasts effectively counter-charge to help another unit out whereas the Fiends attack first). Now an interesting thing here is that their effect on enemy Psykers makes them pretty much perfect for hunting and killing them, especially if they are not in a unit. 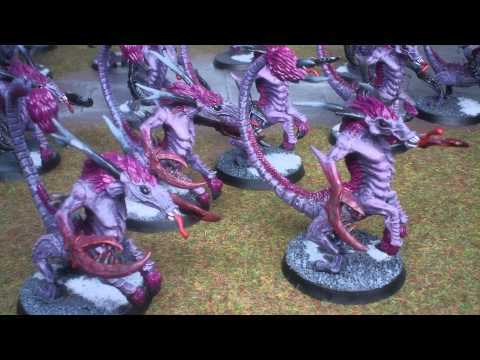 Against Tyranids this would mean they go for the Synapse creatures, against Eldar they hit the Farseers and against Space Marines they take down the Librarians. These units can be added to a unit but it's a lot more common to see them out on their own and that leaves them vulnerable. There's also the fact that it's rare for most units to have a higher initiative than the Fiends which means that the -5 penalty will effectively give the Fiends a free round of attacks which is another reason why it is better to take larger units because you're upping your chances of wiping out some dangerous enemy characters. So there we have it, another versatile assault unit that is more offensive than defensive but with some excellent perks. They can either be used to support another units charge or as character hunters and in either of these they will do well. The points cost of these isn't too bad either so a larger unit (or multiple smaller units) is a viable option in a smaller army. Of course that's saying nothing for the financial costs of a larger unit but then we're all aware by now that the hobby we're enjoying is an expensive one. Now these aren't brilliant to bring in with Deep Strike because they can't assault on the turn they are brought in (stupid rule) but if you can bring them into decent cover and then make an assault in the next turn. Or you can just have them go by foot because they'll probably cover more ground that way. I'm not sure which way is best to be honest with you so if anyone has experience of which is best please leave a comment to share your experience. Musk takes them to 1 minimum.